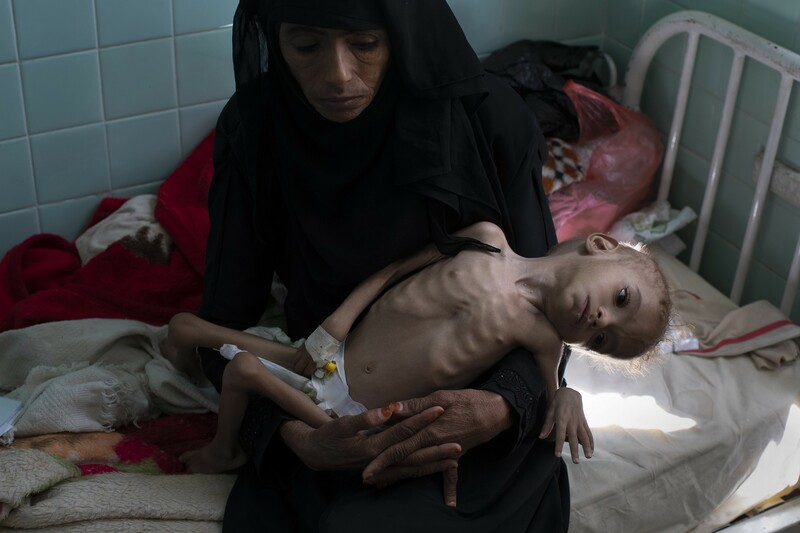 Bassam Mohammed Hassan, who suffers from severe malnutrition and cerebral palsy, is held by Madiya Ahmad, at a hospital in Sanaa, Yemen, on Oct. 15, 2018. Growing international concern over the dire humanitarian situation in Yemen, where the United Nations warns that a mass famine is looming, led to a concerted diplomatic push late October by the U.S. to finally get both sides around the peace table. But the pace of fighting has only escalated. HODEIDA, Yemen — The fight in Yemen has escalated dramatically over the past week, exacerbating a dire humanitarian crisis that the United Nations says could spiral into famine — despite, or even because of, a diplomatic push by the United States to get both sides to the peace table. Columns of Yemeni militias fighting under the coalition flag have burst across a major front line and swept through the desert on the eastern edge of the city, threatening to encircle it completely, they say. Warplanes and attack helicopters have pummeled Houthi positions in the city in what aid workers called a near-continuous barrage of air attacks. The surge in fighting started days after U.S. Defense Secretary Jim Mattis called for the Saudi-led coalition and the Houthis to start peace talks within 30 days.